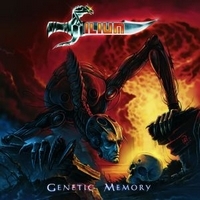 Australian power metal outfit Ilium is presenting Genetic Memory, their 2nd album with Mike DiMeo who seems to be perfect for the Ilium sound. Two years after the release of Ageless Decay it's time for Genetic Memory. They kick off with Kinaesthesia, a power metal track with heavy riffs and symphonic keyboard passages. Partly their NWoBHM roots are audible, but they also show similarities to melodic / symphonic metal bands. It's the 2nd album with former Riot / Masterplan singer Mike DiMeo and obviously Mr. DiMeo feels more comfortable with Ilium then with Masterplan - at least when it comes to singing their songs. The opening passage of Littoria is keyboard-based, symphonic and quite dramatic, but the song changes a bit when the guitars join in. They change speed and atmosphere, but it's the memorable guitar lead and the catchy chorus which will win over the listener. Great guitar play by Jason Hodges! For Grey Stains The Rainbow they ease off a bit which gives Mike DiMeo more space for his emotional vocals. A memorable vocal line will which is backed by guitar. Perhaps the easiest way to get into the album. Time to speed up again with The Immortality Gene, a song based on sharp, heavy riffs. One more time Mike DiMeo is adding powerful vocals and shouts, but also some emotional parts which due to his raspy voice never sound too sweet. Jason Hodges' guitar leads you into the title track Genetic Memory which is a heavy, guitar-driven tune. The opening passage seems to be influenced by Irish or Celtic music, but then they head into an up-tempo riff-based rocker. Due to speed changes they can keep the listeners attention on this tune which is just shy of 8 minutes. The synthesizer which opens up Hostile Sky is very 80's, but the mid-paced rocker is based in traditional metal - even if it has an 80's edge. Again it's DiMeo / Hodges who ennoble the tune. A stomping rocker is Neanderthal Within, but it isn't as simple as one might expect. And then Jason Hodges surprises the listener in an instrumental passage with some shredding. One of my favorites is Ghosts In Flesh which once more offers speed changes, but has an epic, symphonic touch. An ear catcher. The closer Irrinja is kicked off with didgeridoo and so sticks out, but then they head into an atmospheric tune. It takes bit, but as the song is more then 11 minutes long there is more then enough time to build up. It becomes an up-tempo track with a dark edge, sharp riffs, melodic leads and varying vocals. Well done! The album was mixed by Martin Kronlund who found the right balance between the instruments and vocals, giving everybody the chance to shine. If you look for something completely new, then Genetic Memory won't be the right choice, but if you like melodic power metal with memorable guitar leads and great hooks, then this one will please you. When it comes to the Australian music scene, then it's usually about AC/DC, Rose Tattoo and some more pop or rock artists. And so I missed Ilium, a band which is around since 1998 and Ageless Decay is their 4th album. In 2006 former Dionysus keyboarder Kaspar Dahlqvist joined them and since 2008 Mike DiMeo is their singer. And it's Mike DiMeo who draws attention to the band, the former Riot and Masterplan singer made many friends through the years. With the opener Mothcaste they present an up-tempo power metal song with a great melody line - but it's Mr. DiMeo's voice which makes them differ. The guitars have a neo-classical touch, but Adam Smith and Jason Hodges also deliver heavy riffs. The Australians give Mike DiMeo the space to show his talent - and he makes the songs shine! At the beginning Hibernal Thaw is slow and leads acoustically into the song, but then the song explodes! 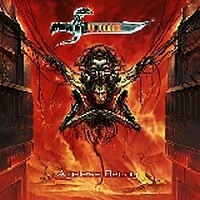 It becomes a heavy, progressive power metal tune. Dahlqvist's keyboard stays in the background, but is still an important part of the Ilium sound! Later in the song Kaspar Dahlqvist gets more up front and dominates the sound for a moment. After a heavy and doomy start they speed up for Tar Pit, but this song is a sonic roller coaster ride! At Nubia Awakes they create a slightly dark atmosphere, but also use Oriental elements. They speed up for Ageless Decay, a fast guitar-driven track. But Ilium has always great melodies on top and surprise you with twists and turns! The closer Idolatry is kicking off symphonically and anthem-like, then it becomes a heavy rocker - and then they speed up. Another roller coaster ride, but as this song is more then 7 minutes long, it's the best they can do to keep the listeners attention. And at the end this diversity is the key to Ilium's songs! A great album without fillers! I'm glad that Mike DiMeo found a band where he gets the chance to shine. He's an incredible singer and in my opinion he had no chance to show his talent in Masterplan. But even the best singer can turn a bad song into a good one! And Ilium offer great songs and so give him the playgound for his vocals. At the end it's the combination of it. Check out: Hibernal Thaw, The Neo-Mortician, Tar Pit and Ageless Decay.